12.5" RCOS @ ~f/9 (2880 mm fl) 0.643 arcsec / pixel. Zoomify image scale is 0.86 to 3.07 arcsec / pixel. 3/13/2009 to 3/24/2009 Chino Valley, AZ... with CCDAutoPilot3 & CCDSoft. CCDSoft, CCDStack, Photoshop CS w/ the Fits Liberator plugin. Noel Carboni's actions and Russell Croman's GradientXTerminator. eXcalibrator for (u-g), (g-r) color calibration, using 7 stars from the SDSS database. CCDStack to calibrate, register, normalize, data reject, combine the sub exposures, LRGB color, and luminance deconvolution. Sir William Herschel (1738-1822) discovered NGC 4565. 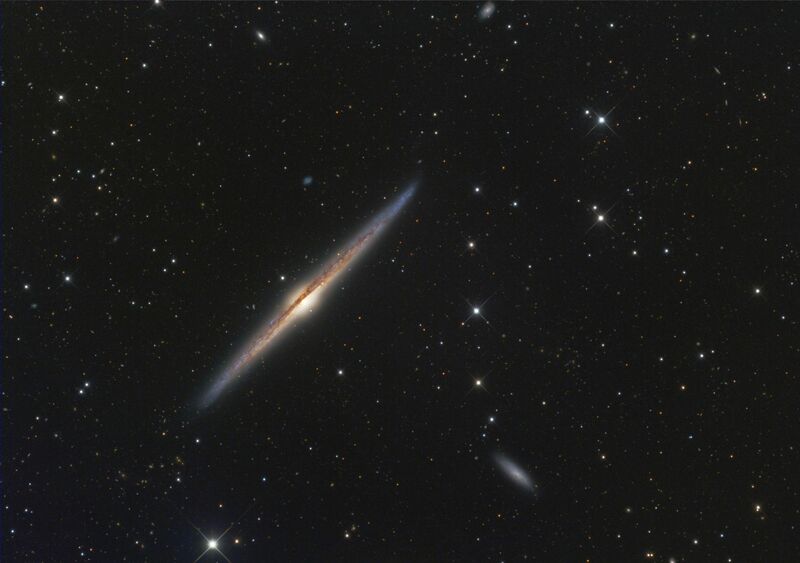 Also known as the Needle Galaxy, NGC 4565 is about 40 million light-years away, in the constellation Coma Berenices. The galaxy's nearly edge on alignment presents a spectacular view of the dust lanes intersecting with the core. The bright central core get its color from the dominance of older yellowish stars. The galaxy to the lower right is NGC 4562. It's about 75 million light-years away, and like NGC 4565, spans about 100,000 light-years.